Well, Blogger has some outstanding timing. Just in time for me to have a super cute little baby, Blogger now allows me to pre-publish posts. So, this Roundup is being brought to you magically without me having to log in and publish it on Friday morning. So, posting regularly shouldn't be as bad as I thought, but don't hold me to it. The first week with Darcy was just amazing. Those first few days were very tough, especialy since it was next to impossible to get sleep in the hospital, but now that she's home with us we are having a great time getting to know eachother. Jason at Jason Cooks made Banana Oatmeal Pancakes. Any chance someone wants to come over and make them for me? Amber's Delectable Delights features one of my new favorite Rachael Ray recipes - Florentine Mac and Cheese with Chicken Meatballs. She found it over at Real Life Foodie Adventures. Doesn't sound like much, but it is outstanding. 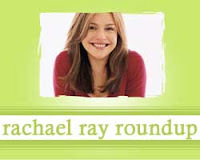 Buzzer Blog informs us that Rachael Ray will be appearing on the new remak of Million Dollar Password, a game show. Rachael Ray somehow found herself inside a campaign scandal! Teresa at I'm Running to Eat recommends Rachael's recipe for Tomato and Bread Salad (also known as Panzanella). YumSugar features Rachael's recipe for White Clam Pizza. Vegan Revolution was excited to see a vegan recipe on Rachael Ray's Food Network show, 30 Minute Meals. It's a recipe for Hoisin Noodle Bowls. Amanda at Down Home Dieting tweaked Rachael's recipe for Oatmeal Cookie Pancakes and they look outstanding. Jessica of What's Cooking in the Orange Kitchen? made Stuffed Pepper Stew. Check out this post at Semper Ohana to see what happens when good recipes go bad.